The DAV MX™ CircSub from Churchill Drilling Tools, an oilfield service company specialising in drilling innovation, was selected for the world’s deepest and hottest geothermal borehole in the Iceland Deep Drilling Project (IDDP) on the Reykjanes Peninsula. 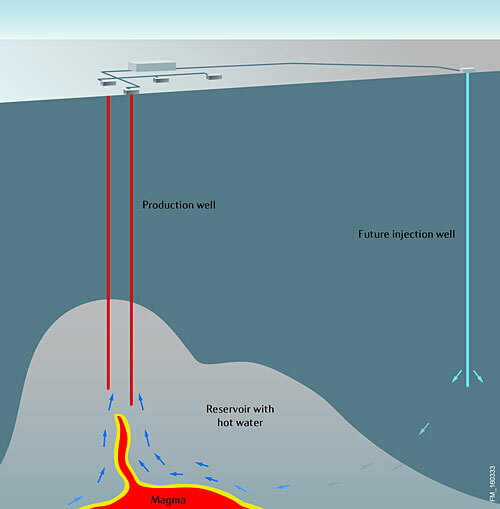 The IDDP well is earmarked to become an integral part of Iceland’s geothermal energy production – providing clean, renewable energy by using supercritical steam heated by the earth’s magma. 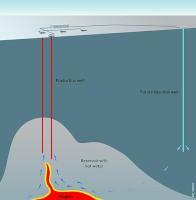 Drilling took 176 days and involved the deepening of an existing geothermal borehole to a depth of 5 km. The IDDP team encountered temperatures of 427° C at a depth of 4,659 m – simultaneously creating the deepest and hottest ever geothermal borehole and encountering supercritical conditions at a shallower depth than anticipated. Samples were taken to surface to ascertain fluid chemistry and the drill presented an unprecedented look into the depths of the earth’s crust. The DAV MX™ CircSub was selected on the recommendation of a major operator and partner in the IDDP product due to its robust temperature resistance and experience in HPHT conventional wells. The tool offered a contingency for the IDDP team against pack-off related circulation loss in which the bottom hole assembly (BHA) components would be literally cooked if circulation was lost.